The drivers claimed they were "coming from very far away and had been stopping and collecting oranges along the way." The police in Seville found two cars packed with stolen oranges. 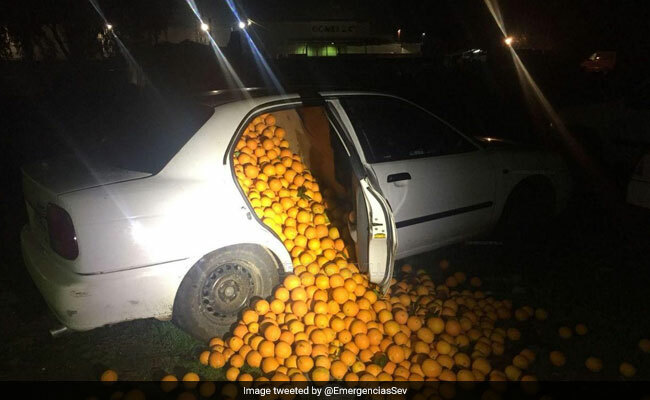 In a bizarre incident, police in Seville, Spain, pulled over two cars filled to the brim with stolen oranges. Pictures shared by the Seville Police show oranges tumbling out of cars that were filled with 4 tonnes of fruit. According to Europa Press, the incident took place in the Seville town of Carmona on January 26. Five people were arrested for the theft. The police reportedly became suspicious after spotting three cars that abruptly changed directions on spotting police patrol cars. After a short chase down a dirt path, they managed to pull over two of the three cars. While one was being driven by a couple and their adult son, the other was a tourism car driven by two brothers. Oranges overflowed from one vehicle, while the other contained hundreds of oranges packed into bags. None of the five people could tell the police where the oranges came from. The drivers claimed they were "coming from very far away and had been stopping and collecting oranges along the way," Europa Press reported. They were arrested at the scene after the police learned that a warehouse in Carmona had reported the theft of a large number of oranges only a few hours ago.